Petal Sonatina is a playful floral that brings cheer to home decor and more! 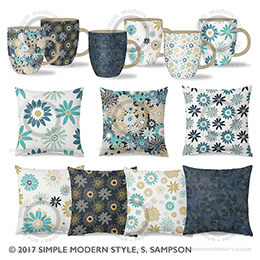 This collection consists of one main pattern and 6 supporting patterns, perfect for home decor, gift, textiles, and paper products. Product mock-ups are shown in bedding, wall paper, wall decor, pillows, canteens, and ceramic mugs. Three colorways, blue-green, red and yellow-orange, are available and custom colors are always available upon request. Please request to see the whole collection through my Art Licensing Show site or contact me for more information.